Looking for simple crafts and activities for Easter? We’ve got you covered! This alphabet egg puzzle is a fun way to practice matching lowercase to uppercase letters! To make the puzzle, cut egg shapes out of colorful cardstock. Then cut each egg in half with a fun pattern and write the lowercase letter on the top half with the uppercase letter on the bottom. To make the game more challenging, try using all the same color paper (so your little ones can’t match by color!). As always, feel free to adapt, based on the needs of your learners! These thumbprint chicks are a cinch to create and make the perfect Easter card! Dip your little one’s thumb into yellow paint and then stamp the paper. Use an orange marker for the beaks and feet and a black marker for the eye. Feel free to encourage your child to add grass, a message, or any other creative touches! For an Easter egg twist, open plastic eggs and hide a letter inside (or a word for older kids!). Then cover with play dough and let your little ones open their surprises! When they open them, challenge them to say the letter or sound! Dying Easter eggs is often a fun way to celebrate the Easter holiday. You can make this activity a bit more educational by using a white crayon to write on the eggs before your little ones dye them. Write their name to practice name recognition, letters, sight words, or any other things you want to focus on! Your little ones will love dying the eggs and seeing the words appear, and you’ve also snuck in some learning! Hooray! We hope you enjoyed our Easter crafts and activities! For more great ideas, check out our previous Easter post, Fourth of July, Halloween, Thanksgiving, and Holiday crafts and activities! And don’t forget to subscribe, so you don’t miss any more great letter crafts and activities! Need simple crafts and activities for Valentine’s Day? We’ve got you covered! Hide-and-Seek Hearts is super simple, but such a fun game for your kiddos to play. Cut out hearts (we went super easy with foam hearts, but any hearts will do!) and write a letter on each one. Then hide the hearts around your home or school for your kids to find! As they find each one, encourage them to say the letter sound or name. And make sure to have fun! This confetti heart card will be a hit with your little one! It may require adult help to assemble, but the result is mesmerizing! Start by cutting a heart shape out of a piece of cardstock. Then cut a slightly larger heart out of both another piece of cardstock (we used pink) and a laminating sheet. Tape the laminating sheet over the original heart cutout, followed by the pink cardstock heart. When taping to the pink heart, leave a space at the top. Pour glitter in between the laminating sheet and pink cardstock. Finally, finish taping the top of the heart to make sure the glitter can’t escape, and voila! A fun, snow-globe effect of glitter in a heart-shape, making it the perfect Valentines card for your little ones to give out or keep for themselves! This thumbprint craft can be completed in just a few minutes, but it may become artwork you will cherish for years to come! We used a mini-canvas with a magnet attached, so it could easily be displayed on the fridge. But feel free to use cardstock, watercolor paper, or whatever you have accessible! Dab paint on your little one’s thumb and help them make a heart shape with two thumb-stamps. After they wash their hands, give them a marker to write a message like “I love you.” Hang the final product on the fridge or give as a gift to someone you love! No prep time? No problem! We love this ABC Heart Letter Match. We wrote uppercase letters on sticker hearts we found in the Target dollar section, and then we wrote matching lowercase letters on a piece of paper. Give the paper and stickers to your little ones so they can match the letters. This doubles as a great fine motor activity! Let’s be honest—sugar cookies are perfect for any holiday. Letting the kids decorate their own cookies adds extra fun and excitement— plus, it helps to keep those little hands busy! We hope you enjoyed our Valentine’s Day crafts and activities! For more great ideas, check out our Easter, Fourth of July, Halloween, Thanksgiving, and Holiday crafts and activities! Need simple crafts and activities for the holidays? We’ve got you covered! These little alphabet Christmas trees are a cinch to put together! We cut triangles out of green cardstock, wrote a letter on each one, and let our little ones decorate the trees! We added a clothespin to help them stand tall. Now your little ones can create an alphabet forest, spell words, or anything else you or they can imagine! Bananas and strawberries make this candy cane snack a perfect healthy holiday treat! Bowtie pasta makes for a wonderful holiday sensory bin! To make it extra special, add color! To do this, first pour ¼ cup rubbing alcohol into a Ziploc bag. Next, add 5-8 drops food coloring. Then add 2 cups of uncooked pasta, seal the bag and mix until the pasta is evenly coated. Finally, dump the pasta onto a baking tray lined with a paper towel. Let dry several hours or overnight. Repeat this process for each color you want. Once dry, add to a bin with letters and let your little ones have fun exploring and learning! Here’s another simple and yummy holiday treat! Give your child a few banana slices, pretzel sticks, and chocolate chips, and let them build their own snowman snacks! This holiday game can be customized to fit any shape or theme, making it one of our favorites. Start by drawing an outline of a shape, such as a dreidel, snowman, or tree. Add circular stickers around the outer-edge of the outline, with designated “start” and “end” spots. Then, grab a die, game markers for each player (we used gumdrops! ), and flashcards. On each person’s turn, they can choose an ABC See, Hear, Do flashcard (or homemade letter cards), say the letter name, the letter sound, and a word that starts with that letter. If they get them right, they roll the die and move that number of spaces. The best part is that you can change the rules and content to fit your child’s specific needs! Don’t forget to DM us your own versions! We hope you enjoyed our holiday crafts and activities! For more great ideas, check out our Thanksgiving, Halloween, Easter, or Fourth of July crafts and activities! Or check out our letter crafts and activities for the letters C, A, T, M, S, R, I, P, B, F, O, G, L, J, U, H, D, W, E, N, K, Y, V, X, Q and Z! Need simple crafts and activities for Thanksgiving? We’ve got you covered! Leaf Stomp is a fun indoor activity that encourages lots of moving and letter practice! To prepare, cut leaf shapes out of cardstock and add a targeted letter or letter blend on each. We suggest laminating them for extra durability. Then play lots of letter stomping games! You can call out different letters while your little ones stomp on them and say their sound. You can line the leaves up in a row and have your little ones hop from leaf to leaf saying the letter sounds. Or you’re welcome to come up with your own fun game—please let us know if you do! This turkey handprint is the perfect Thanksgiving keepsake to make with your little one! Thanksgiving is a classic time to reflect on what you are grateful for. Encourage your little one to think grateful thoughts with this adorable turkey gratitude craft! We love food crafts! This little turkey is made of a graham cracker, Nutella, candy corn, candy eyeballs, and writing frosting. It makes an easy but delicious treat! We hope you enjoyed our Thanksgiving crafts and activities! For more great ideas, check out our Halloween, Easter, or Fourth of July crafts and activities! Need simple crafts and activities for Halloween? We’ve got you covered! This is a perfect pre-carving pumpkin activity! Write a few letters on your pumpkins. Then write matching letters on small stickers. Encourage your child to match the stickers to the letters on the pumpkin. They can also practice saying each letter name and sound as they find them! This spider web art activity is super cool. Adults can easily prep by drawing a spider web with a white crayon on a white piece of paper. Then let your little ones paint the paper with watercolors. As they paint, a spider web will magically appear! Halloween is filled with all sorts of creepy things, so why not make a sensory bin filled with googly eyes and spider rings? Throw in some alphabet letters, and you’ve got an easy and fun activity to engage your little ones! Don’t forget to encourage them to say the letter names and sounds as they find them! This fun alphabet tracing activity uses googly eyes—we couldn’t resist! They’re perfect for Halloween! This delicious and fun parfait is a scrumptious and (mostly) healthy Halloween snack! Even better, you can put it together in a snap! We hope you enjoyed our Halloween crafts and activities! For more great ideas, check out our Easter crafts, Fourth of July crafts and activities, or our letter crafts and activities, the letters C, A, T, M, S, R, I, P, B, F, O, G, L, J, U, H, D, W, E, N, K, Y, V, X, Q and Z! Need simple patriotic crafts and activities for the Fourth of July? We’ve got you covered! These Splatter Art Alphabet Stars are a great way to add even more fun to kid crafting! Using cardstock, cut out as many stars as you want. Then find a place that can get a little messy (outside works great!). Lay the stars on the grass or over newspaper, butcher paper, etc. Then help your child dip their paintbrush in blue or red paint and “splatter” the paint all over the stars! Once all the splattering is complete, let the stars dry. At that point, you can add letters to write words for a cute decorative banner, or you can play games, like hiding them around the yard for little ones to find! Either way, this will be a fun (and messy!) project you and your child can enjoy together! Fireworks are an iconic part of Fourth of July, but cranky kids who stay up too late are… not so fun. So instead of staying up late to watch them, you and your little ones can make your own! Using glue, make fireworks shapes one or two at a time. Cover each new glue addition with your choice of colored glitter, making sure to shake off any excess. Repeat until you have filled your paper with bright and colorful glitter fireworks! The Fourth of July isn’t complete without a parade! Why not make an alphabet parade with siblings, neighbors, cousins, parents, or whoever wants to join in on the fun? All you need are alphabet flags (and candy to throw at the spectators)! To make the flags, grab paper, sticks, and markers. Start by cutting a piece of paper to the desired size. Add a targeted letter to each side, then let your child decorate their flag. When they’ve finished decorating, tape a stick or skewer to it, and it’s ready to be used for the parade! Don’t forget to encourage everyone to say or shout their letter sounds as they march! Try this easy but adorable painted handprint flag! All you need are blue and red paint, a piece of paper or cardstock, and a paintbrush. First, paint your child’s hand with blue paint. Once covered, stamp their hand in the upper left corner to represent the stars. Then, using red paint and a paint brush, encourage your child to paint stripes horizontally across the paper. Let dry and enjoy their patriotic artwork! Try this easy and healthy American Flag snack to celebrate the Fourth of July! First, spread cream cheese over a graham cracker. Next, add blueberries or blackberries in the upper left corner as the “stars.” Finally, let your little one make stripes using cut up strawberries. Yum! We hope you enjoyed our Fourth of July crafts and activities! For more great ideas, check out our Mother’s Day crafts, Father’s Day crafts, or our letter crafts and activities, like the letters C, A, T, M, S, R, I, P, B, F, O, G, L, and J ideas, crafts, and activities! And don’t forget to subscribe, so you don’t miss any more great letter crafts and activities! Stumped for Father’s Day ideas? Check out our simple and cute Father’s Day crafts, perfect for little hands to make! What better way to show your love for Dad than with a handprint and an “I love you”? This project is super easy! Grab a mini-canvas at your local craft store or dollar store. Paint your child’s hand with a color of their choice. Then stamp the canvas with their hand and let them write “I love you” (don’t forget to wash their hands first!). If they can’t write yet, write the note for them! Such a simple and easy way to show Dad he’s loved! Here is another simple Father’s Day craft! Tape a message on a piece of cardstock with painter’s tape. We spelled out “I love Dad,” but feel free to write whatever you’d like! Then let your little one fill the paper with paint! After letting the paint dry, carefully pull off the tape, and you’ve got a personalized message just for Dad! This simple photo frame takes only a few supplies, but it results in an adorable present for Dad! You’ll need an 8x10” frame, a piece of cardstock, markers, scissors, and a photograph. Use the photograph as a guide and trace the center cut-out of the cardstock (you can also use a ruler or eyeball it). Remember to make the cut-out just a hair smaller than the photo, so that the photo will stay in place more securely. Cut out the traced shape. Then let your little one color, draw, or write on the remaining cardstock (this will become your photo mat). Once it’s complete, tape the photo to the back of the mat, stick it in the frame, and you’ve got an awesome craft Dad will love! We hope you enjoyed our Father’s Day crafts! For more great ideas, check out our Mother’s Day crafts, Easter and Spring crafts and activities, or our letter crafts and activities, including the letters c, a, t, m, s, r, i, p, b, f, o, and g. And subscribe so you don't miss any future postings! Stumped for Mother’s Day ideas? Check out our simple and cute Mother’s Day crafts, perfect for your little ones to make! Your child can make a beautiful vase of paper flowers that will outlast any cut flowers! First, give your child a variety of colorful paper. Using scissors, encourage them to cut various shapes and turn them into flowers—the more variety the better! Cut out a vase, add pipe cleaner stems, and glue the entire creation to a blank piece of paper. Voila! A fun craft for your child and beautiful flowers to give away to a loved one! Here’s a simple but adorable Mother’s Day keepsake card idea! Fold a piece of cardstock in half. Then have your little one press their fingers in various colors of inkpads. Next, your child can stamp their fingerprints onto the front of the card. Finally, using a marker, create flowers, a sun, animals, or anything else you want from the fingerprints! Write “Happy Mother’s Day,” and you’ve got a beautiful keepsake card for a loved one! These popsicle stick frames are a cinch to make, but will be a hit with those who receive them! Let your child color popsicle sticks using markers, crayons, or even paint. Make sure an adult carefully hot glues the sticks together into a square shape. Cut a picture to size and glue it to the back of the frame. Stick a magnet to the back and you’ve not only got the perfect gift, but also fabulous fridge art! We hope you enjoyed our Mother’s Day crafts! For more great ideas, check out our Easter and spring crafts or our letter crafts and activities, like the letters c, a, t, m, s, r, i, p and b. And subscribe so you don't miss any future postings! We've got a lot of fun Easter and Spring ideas for you! Try some of these crafts or activities to reinforce the letters and their sounds. These eggs aren’t filled with sugary candy, they’re filled with letters! Your children will enjoy hunting for eggs while also reinforcing letter sounds! After they’ve found all their eggs, encourage them to say the letter sounds as they open each egg. For more advanced learners, add groups of letters to the hunt, so they can create and read the words hidden inside. Enjoy all the fun without the sugar rush! Make these cute egg letters using colorful cardstock and crepe or tissue paper. Cut the cardstock into egg shapes and write a letter outline on each “egg.” After your child or student crinkles the crepe or tissue paper into small balls, he can glue them to the inside of each outline. Let dry, and then hang them up for a colorful Spring or Easter display! Try this easy and engaging activity to practice letter sounds! First, show your child or student how to make their own “bunny” with white pipe cleaners, two white pom poms, and a small pink pom pom for the nose. Help her hot glue the pieces together. Then hide orange and green paper carrots all around your house or classroom. Your child’s little "bunny" can hop to collect the alphabet carrots! Remember to encourage her to say the letter sounds as she finds the carrots! To make this easy alphabet-eating bird, cover a cylinder-shaped canister with blue paper, glue a circle on the lid of the container for the face, and then add wings, a beak, and feet. Cut a hole in the lid to act as a mouth for letter-gobbling! Encourage your child to say the letter sounds as he feeds this hungry bird! Make this adorable baby bird craft using a paper bag, plastic eggs, orange and blue paper, and a marker. First, crinkle the paper bag into a nest shape. Then transform the plastic eggs into baby birds by cutting a beak out of orange paper and gluing blue paper wings to the sides. Add two eyes and voila! Your baby bird craft is complete (and adorable!). For more great Easter ideas, check out our post on 7 Letter-Themed Easter Basket Ideas. And don't forget to check out our previous posts for ideas, crafts, and activities for the Letter C, Letter A, Letter T, and Letter M! Then subscribe, so you don't miss any future postings! Wondering what to put in your child’s Easter basket? Why not take a break from the usual candy? Here are some of our favorite letter-themed games and toys that would make great additions to any basket. ABC Spot It: This is one of my son’s favorite games. He loves trying to match the letters to beat his brothers! Melissa & Doug See Inside Alphabet Peg Puzzle: This is a classic! Pegs make it easy for little fingers to grasp the letters, and fun animal pictures on each letter give hints for where the letter goes. Munchkin 36 Bath Letters and Numbers: Make bathtime fun with these foam letters! These are a great way to practice spelling words. We like to make up silly words, too. Learning Resources Alphabet Soup: Not only is this a fun toy, it's a great way to play with letters. 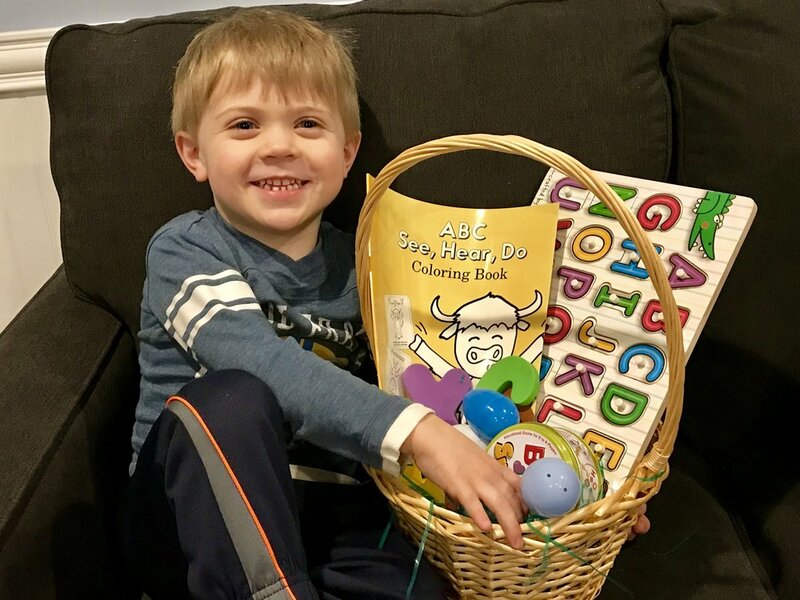 ABC See, Hear, Do Coloring Book: Okay, maybe we’re biased here, but the ABC See, Hear, Do Coloring book is the perfect size for an Easter basket! Plus, coloring is fun and helps develop fine motor skills. 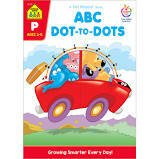 ABC Dot-to-Dot Workbook: We love this dot-to-dot workbook! The pictures are cute, and it helps children learn letter order. Melissa and Doug Alphabet Express Jumbo Jigsaw Floor Puzzle: This puzzle has nice big pieces and is ten feet long! It has cute animal pictures to go with each letter, and what's more fun than an alphabet train? All aboard! What are you including in your child’s Easter basket? Any other fun letter-themed toys or games we missed? We’d love to hear about them!